Life insurance is indeed the cornerstone of financial planning. Not only does having a life insurance policy provide economic protection against unfavorable events, but no less important, it is a source of funds to secure a financial future. For those having a family that depends on their income, the policy allows the family to use the proceeds to help replace the policy holder’s income and eliminate his or her debt if something happens to the bread winner. Regardless of one’s quality of life, people live with uncertainty. And life insurance is an unselfish financial tool to get surety in times of uncertainty. With more investment instruments available in the insurance industry, insurance products become an effective way of saving money for medium-term needs like building up the funds for children education, and for long-term needs like preparing a comfortable retirement lifestyle. It is not exaggerated to say that life insurance is a lucrative investment option. In fact, life insurance industry plays its crucial role in financial sector, contributing to the global economic growth in today’s emerging markets. I n Indonesia, the country’s healthier economy and improved performance of capital market have driven up the demand for insurance products. Being one of the world’s fastest growing economies, Indonesia is experiencing an emerging middle-income segment, in which the shifting from low to middle incomes creates stronger purchasing power. The positive shifting of the incomes has also led to the improvement in education sector, therefore raising public awareness of the importance of having a life insurance policy. Despite all the positive changes, only less than 5 percent of the Indonesia’s more than 240 million population currently covered by insurance policy. The low insurance penetration in Indonesia indeed demonstrates great potential for insurance market to grow across the country. Indonesia’s economic growth is a smooth take off to a brighter future, leading to more insurance companies outdoing each other presenting their best offers to attract new clients. Despite all the lucrative benefits of insurance products on offer, there are unfortunately only few world class insurance companies that have established their presence in Indonesia. In line with this, Switzerland based global insurance company, Zurich Insurance Group, has taken a confident stride toward contributing to Indonesia’s insurance industry with the company’s presence in the archipelago. Zurich Insurance made its maiden voyage to Indonesia in 2010 with the acquisition of Mayapada Life, the insurance subsidiary of Mayapada Group. Zurich Insurance controls 80 percent of the shareholding, while Mayapada Group owns the rest. In November 2011, with the license granted by the Capital Market and Financial Institution Supervisory Agency (Bapepam-LK), the company was renamed Zurich Topas Life. Equipped with Zurich Insurance Group’s 140 years of experience in the business and over 60,000 professionally trained staff all over the globe, Zurich Topas Life is indeed a force to be reckoned with. “It’s what drives our confidence to accelerate the business, as our solid team of experienced professionals are ready to compete in the industry. We have seen substantial growth of Zurich in every country the company operates. Now is the golden time to expand the business in Indonesia. Zurich Topas Life is here now and we aspire to become the best insurance company in the world as measured by our customers, shareholders and employees,” Oemin Handajanto, CEO and president director of Zurich Topas Life, asserted. Choosing the right insurance product among the many already established in the market is a concern, as every insurance product offers different coverage in accord with the policy holder’s needs. It is no longer a public secret that many policy holders end up disappointed after finding out that the benefits of their insurance policies are not what they initially expected. The long, complicated claim procedure is the other common problem often experienced by many policy holders. Regardless of the issues, be it the insurance benefits or claim procedure, it’s all often roots from unclear information delivered by agents. There are many agents that focus merely on scoring sales and become oblivious of what their clients actually need from buying an insurance policy. “Agents are the representatives of their companies, and one very powerful way to maintain and enhance the reputation of their companies is by building a solid relationship with their clients. You will not be able to create a bond with your clients if you deliver unclear information that potentially can result in the clients’ misunderstanding,” Oemin advised. 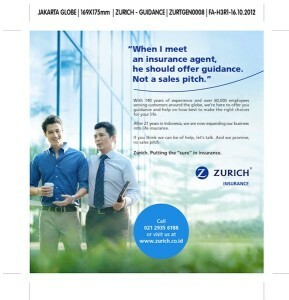 Guidance is one of the four pillars that maintain and strengthen Zurich’s reputation in Indonesia. The other three are simplicity, clarity and surety.